Most complaints into the tech room are for poor stitching - incomplete or skipped stitches or looping on the back. In almost all cases the problem goes away once the machine has been cleaned and oiled! We recommend cleaning and oiling after every few hours of sewing or every 2 -3 bobbins worth and before starting a new project. 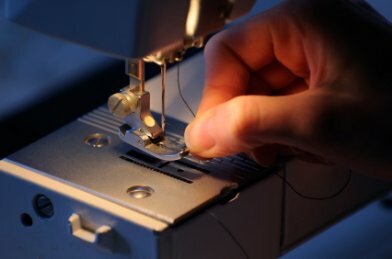 Here's some tips to keep your machine clean and stitching great between professional servicing, which you should have done once a year. 1. Remove the bobbin and hook if possible. Use a soft bristle brush and sweep the fuzz out of the machine. Or better yet, buy one of the vacuum attachments made for this purpose. They do a superior job of removing all the fuzz and loose threads from this area. Whatever you do - DON'T use canned air. This could leave moisture inside the machine. 2. Remove the needle plate by either pressing on the corner or sliding. Refer to your owner's manual if your plate has a screw. With your brush, sweep out the lint between the feed dogs and all other visible areas. Alternately, use your vacuum attachment. Replace the needle plate. 3. Add a drop or two of Bernina oil to the hook race area, replace the bobbin, and insert a new needle and you're good to start. Fuzz and threads in the bobbin area can also cause excessive wear on the parts inside your machine even to the point where the parts need to be replaced in order for the machine to function properly. To decrease the amount of lint accumulation inside your machine, always use a good quality thread. Look at the thread before you purchase or use it. Those little "hairs" you see along the thread line will end up in your machine! A long staple cotton thread, such as Mettler or Aurafil, is a bit more expensive but well worth the price when you consider how much better and cleaner you'll be sewing!